Objective: To evaluate the association of fasting insulin level to incident dementia in a cohort of elderly men. Methods: Data are from the Honolulu-Asia Aging Study, a community-based study of Japanese-American men, aged 71 to 91 years in 1991. Serum insulin was measured in 1991 and participants were grouped based on their insulin levels. Dementia was ascertained in 1991, 1994, and 1996 according to international guidelines. The 2,568 men dementia-free in 1991 were reexamined in 1994 and 1996; 244 new cases of dementia were diagnosed. Survival analysis with age as the time scale was used to estimate the risk (hazard ratio [HR] and 95% CI) for incident dementia associated with levels of insulin. Results: The risk of dementia was increased at the two extremes of the insulin distribution (lower and upper 15th percentiles). Compared to the rest of the cohort subjects in the lowest 15th percentile and highest 15th percentile had an increased risk for dementia (HR = 1.54, CI 1.11 to 2.11 and HR = 1.54, CI 1.05 to 2.26). In men with insulin levels <22.2 mIU/L the risk for dementia decreased with increased levels of insulin (HR = 0.76, CI 0.72 to 0.79 for each increase of one logarithmic unit −2.72 mIU/L of insulin). In men with insulin levels ≥22.2 mIU/L the risk for dementia increased with increasing levels of insulin (HR = 1.64, CI = 1.07 to 2.52 for each 2.72 mIU/L). Conclusions: Both low and high levels of insulin are associated with an increased risk of developing dementia. The possible role of insulin on the risk of developing dementia has not been tested in a prospective study design. Because previous findings suggest both a negative and a positive effect of insulin in the brain, we hypothesized a nonlinear association between insulin levels and the risk for dementia. This hypothesis was tested in a prospective study of a community-based cohort of Japanese-American men. The Honolulu-Asia Aging Study (HAAS) began in 1991 as a continuation of the Honolulu Heart program (HHP), a population-based longitudinal study of 8,006 Japanese-American men born between 1900 and 1919 and living in Oahu, HI, when the study began.12 Participants were seen at baseline (1965–1968) and again in 1968–1970 (examination 2), 1971–1974 (examination 3), 1991–1993 (examination 4), 1994–1996 (examination 5), and 1997–1999 (examination 6). Physical measurements and demographic and medical information were collected at each examination. The study was approved by the Institutional Review Board of the Kuakini Medical Center and the Honolulu Department of Veterans Affairs and informed consent was signed by the study participants. If subjects were demented at the time of consent, approval was obtained from a proxy. Case finding for dementia started in 1991 during examination 4 and has been previously described.13 At that examination, 3,734 men (80% of surviving cohort members) were tested for cognitive function and a subsample underwent a detailed assessment for dementia. Prevalent cases (n = 226) were identified and excluded from the incident cohort. Participation rate was 84% and 90% for the 5th and the 6th examinations.14 Participant cognitive status was measured with the 100-point Cognitive Abilities Screening Instrument (CASI), a combination of the Hasegawa Dementia Screening scale, the Folstein Mini-Mental State Examination, and the Modified Mini-Mental State test.15 The CASI is a well-recognized instrument for the assessment of cognitive function validated among Japanese and Western sample populations.16 Subjects with a CASI score less than an education-adjusted CASI cutoff point (CASI = 77 for those with low education and CASI = 79 for those with high education) or an absolute drop of 9 or more CASI points from the previous examination underwent a specific dementia evaluation. Evaluation of clinical dementia included a neurologic examination, additional neuropsychologic testing, an MRI, and a proxy interview. Diagnoses were made in a consensus conference attended by the neurologist and two other study physicians. Dementia was diagnosed according to Diagnostic and Statistical Manual of Mental Disorders–III R criteria,17 probable and possible Alzheimer disease (AD) were diagnosed following the criteria of the National Institute of Neurologic and Communicative Disorders and Stroke and the AD and Related Disorders Association,18 and the diagnosis of vascular dementia (VaD) was based on the California AD Diagnostic and Treatment Centers guidelines.19 Based on these criteria, 244 cases of incident dementia were identified at examinations 5 (132 cases, 54.1%) and 6 (112 cases, 45.9%), including 148 (64.2%) cases of AD and 39 (16.0%) cases of VaD. To estimate 2-hour post-load glucose a 75 g glucose drink was administrated to subjects (n = 1,742) unaware of their diabetes status, with no gastrectomy, or active peptic ulcer or stomach cancer. Fasting and 2-hour glucose levels were measured by the glucose oxidase method (University of Vermont).23 Type II diabetes was defined according to World Health Organization criteria24 and included individuals with previously diagnosed type II diabetes, those taking oral hypoglycemic agents or insulin, and those with a fasting blood glucose ≥7.0 mmol/L (126 mg/dL) or with a 2-hour post-load glucose ≥11.1 mmol/L (200 mg/dL). Individuals with a fasting glucose between 6.1 (110 mg/dL) and 7.0 mmol/L or 2-hour post-load glucose levels between 7.8 (140 mg/dL) and 11.1 mmol/L were classified as glucose intolerant and included in the nondiabetic group (n = 323). Demographic and health related information was collected at each examination for the entire follow-up of the study. In these analyses, we controlled for potentially confounding demographic factors, such as age and education, and cardiovascular risk factors. Smoking behavior, alcohol intake, blood pressure, and cholesterol were measured at mid-life, from examinations 1 to 3, when their values were less influenced by a possible predementia status. Smoking was categorized by status (never, former, current) and by pack/years of cigarette exposure (packs of cigarettes a year × years of smoking). Alcohol consumption was recorded as grams of alcohol per day (g/day) and recoded as drinks per day (none, <1 drink [13.2 g], 1 to 2 drinks, and ≥3 drinks/day). Systolic and diastolic blood pressures were the means of the measures taken at each examination; within an examination, three measures were made 5 minutes apart and then averaged. History of antihypertensive treatment was self-reported from examinations 1 to 3 and obtained from the drug vials presented at examination 4. Mid-life total cholesterol level was measured at examinations 1 and 3 and averaged; values were determined with Autoanalyzer 1 N24B cholesterol method.12 Stroke and coronary heart disease (CHD) history were assessed at baseline in 1965 and, subsequently, via surveillance of hospital records that has been carried out through the entire follow-up period. Ankle-brachial index (ABI) was measured at the fourth examination and the values were dichotomized with a cutoff of 0.9; values below this point were interpreted as an indicator of generalized atherosclerosis.25 The 11-item version of the Center for Epidemiology Studies Depression Scale (CES-D) was used to measure depression symptoms during the previous week.26 Scores were transformed to correspond to the standard 20-item scale; subjects with a score >15 were considered depressed. Because insulin levels may decrease with weight loss, and dementia is associated with weight loss, we also controlled for percentage of weight change from middle to late life [(examination 4 weight − mid-life weight)/mid-life weight]. Finally, we controlled for apolipoprotein E allele (ApoE). ApoE genotyping was performed by PCR amplification and restriction enzyme digestion27 at the Bryan AD Research Center at Duke University (NC). Participants with one or two copies of the APOE ε4 allele were considered ε4 positive, and were considered ε4 negative otherwise. For all variables with missing data, a separate category within each variable was used so that the observations remained in the analysis. The 2,568 subjects who had at least one follow-up examination for dementia status and complete data on fasting insulin constituted the study population for the analysis. 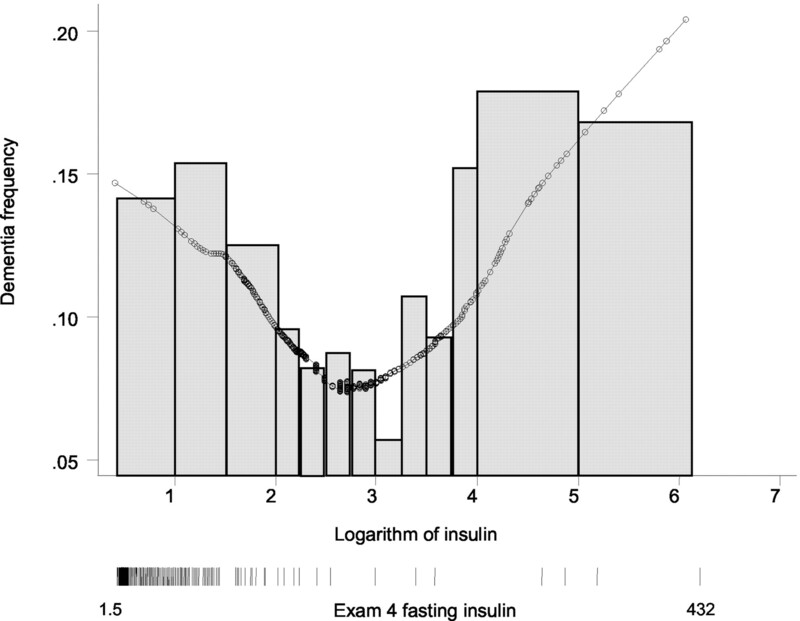 The distribution of fasting insulin was highly skewed. To compare the age and education adjusted insulin levels between demented and nondemented subjects while accounting for this non-normality we fit a generalized linear model (GLM) with a log-link and a gamma distribution.28 This GLM model provides easily interpreted results because the original scale of the variable— in this case insulin—is preserved. For subsequent analyses, fasting insulin was log-transformed to improve the approximation to normality. The mean log insulin level was 2.56 (12.93 mIU/L) ± 0.57 (1.77 mIU/L). For the analysis, the study sample was divided in three groups based on the insulin levels—low (insulin <7.20 mIU/L), medium (insulin between 7.20 mIU/L and 23.0 mIU/L), and high (insulin >23.0 mIU/L)—so that the cutoffs of the groups were the 15th and the 85th percentiles of the insulin distribution, corresponding to one SD from the mean. Characteristics of the three groups of participants were compared using age-adjusted logistic regression models for binary outcomes and age-adjusted general linear models for continuous dependent variables. To test the trend across the three insulin groups we assigned them the values of 1, 2, and 3 and included them in the model as continuous variables. Because the literature suggests both a positive and negative effect of insulin levels in the brain, we visually inspected the data to look for nonlinear relationships. We divided the insulin range in small strata and evaluated the frequency of dementia by stratum (figure). A smoothed curve describing the probability of dementia over the distribution of insulin levels was calculated using the lowess procedure (locally weighted scatter plot smoothing).29 The lowess is a non-parametric regression method that fits a weighted least-squares curve. The smoothed values for incident dementia are obtained as the log of the odds (lod) and then transformed to the probability of dementia (probability = 1/1+ elod). On the figure the smoothed values for dementia probability are represented by filled circles. Figure. The distribution of dementia cases by insulin level. We examined the association of fasting insulin level to dementia with a Cox-proportional-hazard regression model using age as the time scale30 and with the nonparametric log-rank test for equality of survivor functions. Age at dementia onset was assigned at the midpoint date between the last examination without dementia and the first in which the subject was diagnosed with dementia. Subjects who died or did not return to the next follow-up were censored as of the time of the last evaluation. The group with a middle level of insulin was the reference category. To confirm the findings based on the three strata, we used a spline function and treated log-insulin as continuous variable.31 The spline approach identifies points in the distribution where the relationship between the independent and dependent variables significantly changes. Based on visual inspection of the lowess plot we identified the cut-off point. This cut-off was located at 3.1 logarithm units; the exact point selection was based on the likelihood test results and two separate continuous variables were included in the model. With this approach we estimated separate hazard ratios of dementia for log-insulin values <3.1 and log-insulin values ≥3.1 (22.20 mIU/L). The survival analysis was adjusted for age, education, fasting glucose level, and ApoE ε4 status (model 1). Model 2 included the same variables as model 1 plus mid-life blood pressure, cholesterol level, smoking status, alcohol intake, percentage of weight change from mid-life to late-life, late-life depression, ABI, history of type II diabetes, stroke, and coronary artery disease. Because high levels of insulin are prevalent in type II diabetics, we tested whether the association of insulin to dementia differed by diabetes status. The interaction term between insulin both as continuous and as categorical (low, medium, and high) variable and diabetes was not significant so the analyses were not stratified by diabetes status; instead, an indicator variable for diabetes was included in both models as confounder. Subjects with cognitive impairment were included in the nondemented group. Subjects diagnosed with VaD and other types of dementia were excluded from the analysis of the association between fasting insulin and incidence of AD; similarly, AD subjects were excluded from the analysis of the relationship between fasting insulin and VaD. The statistical analysis was performed using STATA 7 statistical software (STATA Corporation, College Station, TX). Subjects included in the analysis were followed for an average of 5.1 years (±1.6 years). During this time, 244 new cases of dementia developed. Mean age at the follow-up entry and exit was 77.4 and 82.5 years. Compared to the medium and high groups, lower insulin levels were associated with older age, and lower prevalence of glucose dysregulation, cardiovascular-related risk factors and a greater reduction of weight from mid-life (table 1). Compared to the other two groups, subjects with high insulin levels had a poorer cardiovascular risk profile. The age and education-adjusted mean level of insulin was not different between all demented and nondemented participants (insulin level = 17.93 mIU/L for incident demented and 15.81 mIU/L for nondemented, p = 0.10) and between participants with AD and those without any dementia (insulin level = 17.11 mIU/L for AD compared to nondemented participants, p = 0.32). A difference was found between participants with VaD and those without any dementia (insulin level = 24.13 mIU/L for VaD, compared to nondemented participants, p = 0.02). The distribution of dementia cases by insulin level is graphed in the figure. The log-rank test comparing the survival functions among low, medium, and high groups indicated a significant difference among survival curves (χ2 p value < 0.005). Compared to those with a medium level of insulin, the risk for dementia was higher in those in the low and high groups (table 2). Comparable results were observed for AD and VaD. Increasing values of insulin levels up to 22.2 mIU/L (3.1 log-insulin units) were inversely associated with the risk of total dementia (hazard ratio [HR] = 0.76, 95% CI = 0.72 to 0.79 for an increment of one insulin logarithmic unit) (table 3); higher levels of fasting insulin were directly associated with dementia (HR = 1.64, CI = 1.07 to 2.52 associated with each insulin logarithmic unit). A similar trend of association was observed for AD and VaD. If we excluded the incident cases from the first follow-up, which was closer to the measurement of insulin level, low levels of insulin (≤3.1 log-insulin units) were still inversely related to the risk for dementia (HR = 0.73, CI = 0.67 to 0.79) and high insulin levels were marginally associated with an increased risk for dementia (HR = 1.91, CI = 0.99 to 3.77). This is the first study that evaluates prospectively the potential role of insulin as a risk factor for the development of dementia in a community-based sample. We found a nonlinear association such that high and low levels of insulin increased the risk for dementia. The associations had a similar trend for AD and VaD. Over 50% of the men in the high insulin group were diabetic. The analysis was adjusted for fasting glucose and diabetes suggesting that the association reflects an independent effect of high levels of insulin on the brain. In this same group the results did not change after removing the cases that were diagnosed within 2 years from the insulin measure. Further, the association between low levels of insulin and an increased risk for dementia could reflect the possibility that low insulin is a marker of preclinical dementia. We examined this possibility using two different approaches. We adjusted for weight loss, a possible marker for prodromal dementia, between the examinations prior to and concurrent with the insulin measure.32 Further, we performed a second analysis only on cases that occurred at least 2.5 years after the insulin measurements. The results showed that low levels of insulin were still inversely related to the risk for dementia. The findings of a nonlinear relationship are consistent with data from experimental and clinical studies. CNS insulin is derived mainly from the peripheral circulation.33 In normal conditions insulin passage into the CNS is regulated by a specialized saturable transport system localized in the blood–brain barrier endothelium.34 The system regulates insulin passage into the brain proportionally to the plasma insulin level. Under physiologic conditions, a higher serum insulin level may reflect a higher level of brain insulin and hypoinsulinemia could reflect an insufficient insulinization of the brain. However, the transport of insulin into the CNS is altered in hyperinsulinemic conditions.35 Hyperinsulinemia usually corresponds to a higher level of insulin resistance. Insulin resistance could result in a modification of insulin transport into the brain and a reduction of insulin sensitivity at the cellular level. Thus, it is possible that both hypoinsulinemia and hyperinsulinemia lead to insufficient insulinization in the brain, including those areas associated with cognition. A similar hypothesis was suggested in the Bruneck study36 to explain their finding of a U-shaped relationship between fasting serum insulin levels and coronary heart disease. The authors suggested that reduced insulinization might affect the function of specific cell types involved in the atherogenetic process. Several studies have shown that the insulin degrading enzyme (IDE) is an important regulator of the amyloid-beta protein (Aβ),37 as well as of insulin. High levels of insulin in the CNS may reflect IDE activity and contribute to increased levels of Aβ42 in the cerebral spinal fluid38 and to the accumulations of Aβ in the plaques. Although the frequency of AD in this cohort is similar to that reported in white samples from the United States and Europe, the frequencies of VaD as well as glucose impairment and type II diabetes are higher, as is the case in other Japanese samples.49 Cultural, environmental, and genetic factors may be different in the Japanese-American male population. Additional studies are needed to clarify the role of insulin in the development of dementia especially among older persons in other ethnic groups and in women. Future studies should investigate this relationship with dementia, with a focus on better measurement of insulin resistance and disturbance of insulin signaling in the brain. Supported by the National Institute of Aging contract N01-AG-4-2149, and National Heart, Lung and Blood Institute contract N01-HC-O5102. The authors thank Dr. Qian-Li Xue for statistical advice. Laakso M. Insulin resistance and coronary heart disease. Curr Opin Lipidol. 1996; 7: 217–226. Craft S, Dagogo-Jack SE, Wiethop BV, et al. Effects of hyperglycemia on memory and hormone levels in dementia of the Alzheimer type: a longitudinal study. Behav Neurosci. 1993; 107: 926–940. Kuusisto J, Koivisto K, Mykkanen L, et al. Association between features of the insulin resistance syndrome and Alzheimer’s disease independently of apolipoprotein E4 phenotype: cross sectional population based study. BMJ. 1997; 315: 1045–1049. Kalmijn S, Feskens EJ, Launer LJ, Stijnen T, Kromhout D. Glucose intolerance, hyperinsulinaemia and cognitive function in a general population of elderly men. Diabetologia. 1995; 38: 1096–1102. Craft S, Peskind E, Schwartz MW, Schellenberg GD, Raskind M, Porte D Jr. Cerebrospinal fluid and plasma insulin levels in Alzheimer’s disease: relationship to severity of dementia and apolipoprotein E genotype. Neurology. 1998; 50: 164–168. Zhao W, Chen H, Xu H, et al. Brain insulin receptors and spatial memory. Correlated changes in gene expression, tyrosine phosphorylation, and signaling molecules in the hippocampus of water maze trained rats. J Biol Chem. 1999; 274: 34893–34902. Zhao W, Alkon DL. Role of insulin and insulin receptor in learning and memory. Mol Cell Endocrinol. 2001; 177: 125–134. Adamo M, Raizada MK, LeRoith D. Insulin and insulin-like growth factor receptors in the nervous system. Mol Neurobiol. 1989; 3: 71–100. Watson GS, Peskind ER, Asthana S, et al. Insulin increases CSF Abeta42 levels in normal older adults. Neurology. 2003; 60: 1899–1903. Craft S, Newcomer J, Kanne S, et al. Memory improvement following induced hyperinsulinemia in Alzheimer’s disease. Neurobiol Aging. 1996; 17: 123–130. Voll CL, Auer RN. Insulin attenuates ischemic brain damage independent of its hypoglycemic effect. J Cereb Blood Flow Metab. 1991; 11: 1006–1014. Syme SL, Marmot MG, Kagan A, Hiroo K, Rhoads G. Epidemiologic studies of coronary heart disease and stroke in Japanese men living in Japan, Hawaii and California: introduction. Am J Epidemiol. 1975; 102: 477–480. White L, Petrovitch H, Ross GW, et al. Prevalence of dementia in older Japanese-American men in Hawaii: The Honolulu-Asia Aging Study. JAMA. 1996; 276: 955–960. Havlik RJ, Izmirlian G, Petrovitch H, et al. APOE-epsilon 4 predicts incident AD in Japanese-American men: the Honolulu-Asia Aging study. Neurology. 2000; 54: 1526–1529. Teng EL, Hasegawa K, Homma A, et al. The Cognitive Abilities Screening Instrument (CASI): a practical test for cross-cultural epidemiological studies of dementia. Int Psychogeriatr. 1994; 6: 45–58. Graves AB, Larson EB, Kukull WA, White LR, Teng EL. Screening for dementia in the community in cross-national studies: comparison between the Cognitive Abilities Screening Instrument and the Mini-Mental State Examination. In: Corain B, Iqbal K, Nicolini M, Winbald B, Wisniewski H, Zatta P, ed. Alzheimer’s disease: advances in clinical and basic research. New York, NY: John Wiley & Sons, 1993; 113–119. American Psychiatric Association. Diagnostic and statistical manual of mental disorders, 3rd ed, revised. Washington, DC: American Psychiatric Association, 1987. Chui HC, Victoroff JI, Margolin D, Jagust W, Shankle R, Katzman R. Criteria for the diagnosis of ischemic vascular dementia proposed by the state of California Alzheimer’s Disease Diagnostic and Treatment Centers. Neurology. 1992; 42: 473–480. Burchfiel CM, Curb JD, Sharp DS, et al. Distribution and correlates of insulin in elderly men. The Honolulu Heart Program. Arterioscler Thromb Vasc Biol. 1995; 15: 2213–2221. Laakso M. How good a marker is insulin level for insulin resistance? Am J Epidemiol. 1993; 137: 959–965. Meigs JB, Haffner SM, Nathan DM, D’Agostino RB, Wilson PW. Sample exchange to compare insulin measurements between the San Antonio Heart Study and the Framingham Offspring Study. J Clin Epidemiol. 2001; 54: 1031–1036. Burchfiel CM, Sharp DS, Curb JD, et al. Hyperinsulinemia and cardiovascular disease in elderly men: the Honolulu Heart Program. Arterioscler Thromb Vasc Biol. 1998; 18: 450–457. World Health Organization. Diabetes mellitus: report of a WHO study group. Tech. Rep. Ser., no. 727. Geneva: World Health Organization, 1985. Newman AB, Sutton-Tyrrell K, Vogt MT, Kuller LH. Morbidity and mortality in hypertensive adults with a low ankle/arm blood pressure index. JAMA. 1993; 270: 487–489. Radloff LS. The CES-D scale: a self-reported depression scale for research in the general population. Appl Psychol Meas. 1977; 1: 385–401. Hixson JE, Vernier DT. Restriction isotyping of human apolipoprotein E by gene amplification and cleavage with HhaI. J Lipid Res. 1990; 31: 545–548. McCullagh P, Nelder JA. Generalized Linear Models. 2nd ed. London, UK: Chapman and Hall, 1989. Cleveland WS. Visualizing data, 1st ed. New Jersey: Hobart Press, 1993. Commenges D, Letenneur L, Joly P, et al. Modelling age-specific risk: application to dementia. Stat Med. 1998; 17: 1973–1988. Molinari N, Daures JP, Durand JF. Regression splines for threshold selection in survival data analysis. Stat Med. 2001; 20: 237–247. Shatenstein B, Kergoat MJ, Nadon S. Anthropometric changes over 5 years in elderly Canadians by age, gender, and cognitive status. J Gerontol A Biol Sci Med Sci. 2001; 56: M483–488. Coker GT, Studelska D, Harmon S, Burke W, O’Malley KL. Analysis of tyrosine hydroxylase and insulin transcripts in human neuroendocrine tissues. Mol Br Res. 1990; 8: 93–98. Schwartz MW, Bergman RN, Kahn SE, et al. Evidence for entry of plasma insulin into cerebrospinal fluid through an intermediate compartment in dogs. Quantitative aspects and implications for transport. J Clin Invest. 1991; 88: 1272–1281. Schwartz MW, Figlewicz DP, Baskin DG, Woods SC, Porte D Jr. Insulin in the brain: a hormonal regulator of energy balance. Endocr Rev. 1992; 13: 387–414. Bonora E, Willeit J, Kiechl S, et al. U-shaped and J-shaped relationships between serum insulin and coronary heart disease in the general population. The Bruneck Study. Diabetes Care. 1998; 21: 221–230. Qiu WQ, Walsh DM, Ye Z, et al. Insulin-degrading enzyme regulates extracellular levels of amyloid beta-protein by degradation. J Biol Chem. 1998; 273: 32730–32738. Kern W, Peters A, Fruehwald-Schultes B, Deininger E, Born J, Fehm HL. Improving influence of insulin on cognitive functions in humans. Neuroendocrinology. 2001; 74: 270–280. Santos MS, Periera EM, Carvaho APO. Stimulation of immunoreactive insulin release by glucose in rat brain synaptosomes. Neurochem Res. 1999; 24: 33–36. Avruch J. Insulin signal transduction through protein kinase cascades. Mol Cell Biochem. 1998; 182: 31–48. Blum S, Moore AN, Adams F, Dash PK. A mitogen-activated protein kinase cascade in the CA1/CA2 subfield of the dorsal hippocampus is essential for long-term spatial memory. J Neurosci. 1999; 19: 3535–3544. Cincotta AH, Luo S, Liang Y. Hyperinsulinemia increases norepinephrine metabolism in the ventromedial hypothalamus of rats. Neuroreport. 2000; 11: 383–387. Bouhaddi K, Thomopoulos P, Fages C, Khelil M, Tardy M. Insulin effect on GABA uptake in astroglial primary cultures. Neurochem Res. 1988; 13: 1119–1124. Solano DC, Sironi M, Bonfini C, Solerte SB, Govoni S, Racchi M. Insulin regulates soluble amyloid precursor protein release via phosphatidyl inositol 3 kinase-dependent pathway. FASEB J. 2000; 14: 1015–1022. Hong M, Lee VM. Insulin and insulin-like growth factor-1 regulate tau phosphorylation in cultured human neurons. J Biol Chem. 1997; 272: 19547–19553. Biessels GJ, Kappelle AC, Bravenboer B, Erkelens DW, Gispen WH. Cerebral function in diabetes mellitus. Diabetologia. 1994; 37: 643–650. Biessels GJ, Kamal A, Urban IJ, Spruijt BM, Erkelens DW, Gispen WH. Water maze learning and hippocampal synaptic plasticity in streptozotocin-diabetic rats: effects of insulin treatment. Brain Res. 1998; 800: 125–135. Meneilly GS, Tessier D. Diabetes in the elderly. Endocrinology of aging. Totowa, NJ: Humana Press, 2000.